Can I tell you how hard it was to get this shot without someone walking in the photo...very! 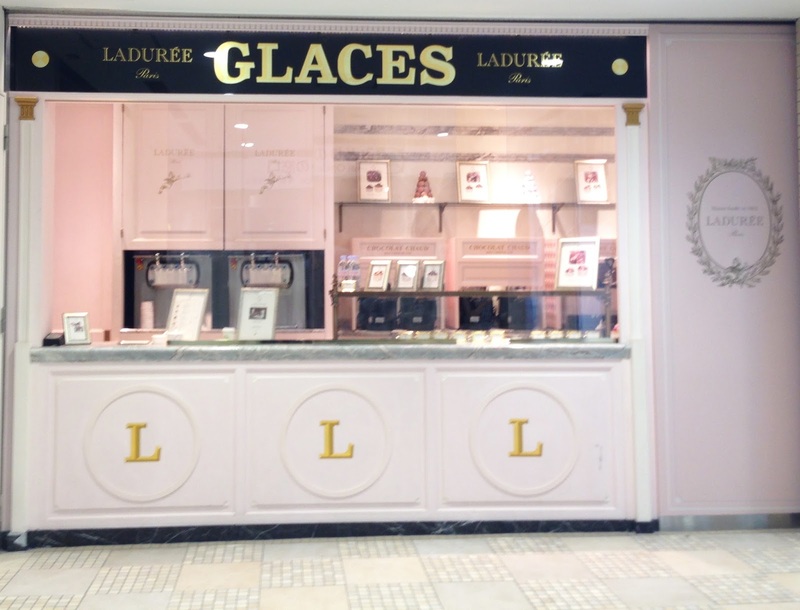 After Shopping at Isetan Mirror, I treated myself to my favorite Laduree soft serve ice cream in Paeva (violet). By the way, I love, love, love, LOVE anything, and everything, Violet! You're being watched, so no skimping on the sauce! Aki ordered the Malesherbes, that's my Paeva right next to it, and our friends ordered the Ispahan. It was so hot, that my Paeva quickly turned into a soup. I'm going to Tokyo on Monday and can't wait to check this place out! No way! How long will you be here? Stop taking pics, dig in!!!! Would love to join you in this cute little place if I ever visit Tokyo! And promise to be my beauty tour guide into Tokyo!!! You know I'll be showing you around. Don't forget to bring your wallet and stomach! This was in November and my coworker was ready to kill me! I had no idea where to find the Laduree cosmetics line and thought we could find it here. If I come to Japan for sure we are hooking up. You know where to find EVERYTHING. I also loved the Loft store. And don't even get me started about Donki. I have another work trip coming up and I was hoping we were coming back to Tokyo but this time we are visiting Seoul to see what the cosmetics scene is like there. I don't know if it can top Tokyo! I recommend stocking up on facial masks while you're in Korea.